When Christopher Katongo was voted BBC African Footballer of the Year in 2012, Zambian fans could finally celebrate seeing one of their own at the top of the continental game once again. Previously, the current FA president Kalusha Bwalya was the only Zambian to have ascended to the apex of the African game with such individual honours. The talented left-footed star won the Confederation of African Football (Caf) Player of the Year award in 1988 but in the two decades that followed, no Zambian came close to emulating his achievement. So when 2012 Africa Cup of Nations-winning captain Katongo was awarded the BBC prize after guiding Chipolopolo to a maiden title, Zambia's football fraternity was lit up with joy. Fans were particularly happy for Katongo since he worked so hard for the team, having given his all in the aim of winning honours for both country and self for over a decade. Many observers, myself included, believe the BBC award was the icing on the cake for the career of a determined individual, who has combined his football with being a soldier. And it came in a year when the Zambia Army promoted him to the rank of non-commissioned officer. While the army respect and delight in his feats, his compatriots hold the forward in similarly high esteem - fully recognising what he has brought to his country. "The BBC African Footballer of the Year award raised the profile of Zambian football," sports journalist Ponga Liwewe told BBC Sport. "After years of declining fortunes for the national team, the award inspired a new generation of Zambian players to believe that they could compete with the best in African football. "Katongo almost single-handedly dragged Zambian football out of the doldrums." At his first two Nations Cups, in 2006 and 2008, Chipolopolo had boarded the earliest plane back home. In 1994, the entire Zambia football team won what was then the BBC African Sports Personality of the Year award. The trophy came as the team reached the Nations Cup final, a remarkable achievement given the plane crash that killed 18 of the country's best internationals the year before. The crash took place off the coast of Gabon, giving Zambia's surprise Nations Cup title in 2012 added poignancy. But two years later, Katongo's influence started to change the team's attitude as Zambia reached its first quarter-finals in 14 years. 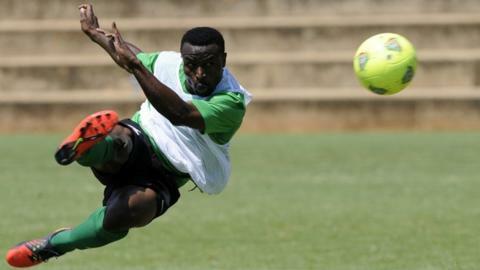 Then came his explosive displays at the 2012 finals, co-hosted by Gabon and Equatorial Guinea. His commanding performances meant Katongo - a model to his peers given his exemplary hard work and dedication - became the first Zambian to be voted player of the tournament at a Nations Cup. He netted three goals in the finals, so finishing joint top scorer with six others. Two came in the group stages, including in a crucial 1-0 win over Equatorial Guinea that secured Zambia's place in the knock-out phase, before he also contributed in the 3-0 rout of Sudan in the quarter-finals. When the final against tournament favourites Ivory Coast produced no goals, Katongo fired home in the penalty shoot-out to help little-fancied Zambia provide one of the Nations Cup's all-time shock triumphs. Afterwards, Katongo's leadership qualities were hailed as being crucial to Zambia's success. So Zambians were delighted when a man nicknamed "Tsunami" - given an explosive goalscoring record at one of his earliest clubs, Green Buffaloes - secured an award that has been won by the likes of Ivorian Didier Drogba, Ghana's Andre Ayew and Nigerian Jay-Jay Okocha. "It was fantastic," said veteran Zambian coach Patrick Phiri, who witnessed the BBC African Footballer of the Year award ceremony. "It lifted Zambia to the highest level on the continent, especially since he was the first individual to receive such a high-profile award from the BBC." "This is the thing I will never forget in my life," he told BBC Sport after receiving the prize. "Just to be among the great players who have won this award is unbelievable," added a man who beat Toure, Drogba, Senegal's Demba Ba and Moroccan Younes Belhanda to the trophy. Now 33, Katongo is on a retirement path. And after a lengthy spell outside Zambia, he is back at Green Buffaloes where his achievements are still recognised by football fans, who occasionally grant him an impromptu standing ovation.